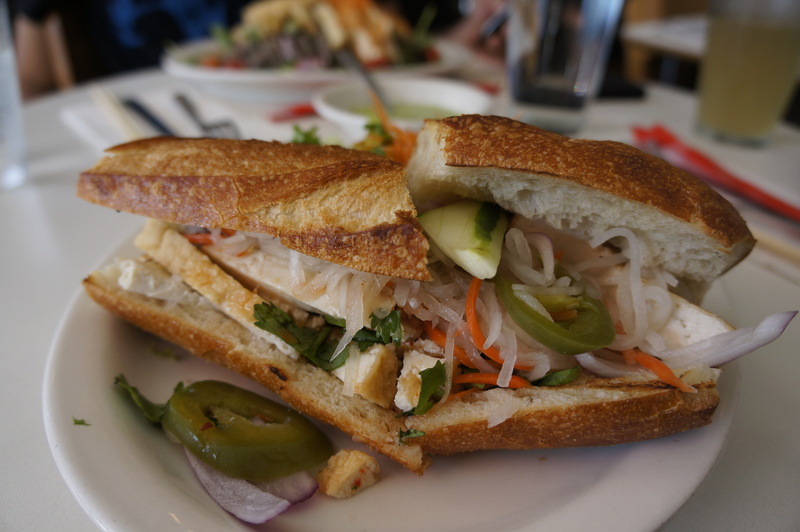 I had heard all good things about Mooncake Foods from Midtown Lunch – my go-to resource when I am looking for lunch in the midtown area – and was not disappointed. 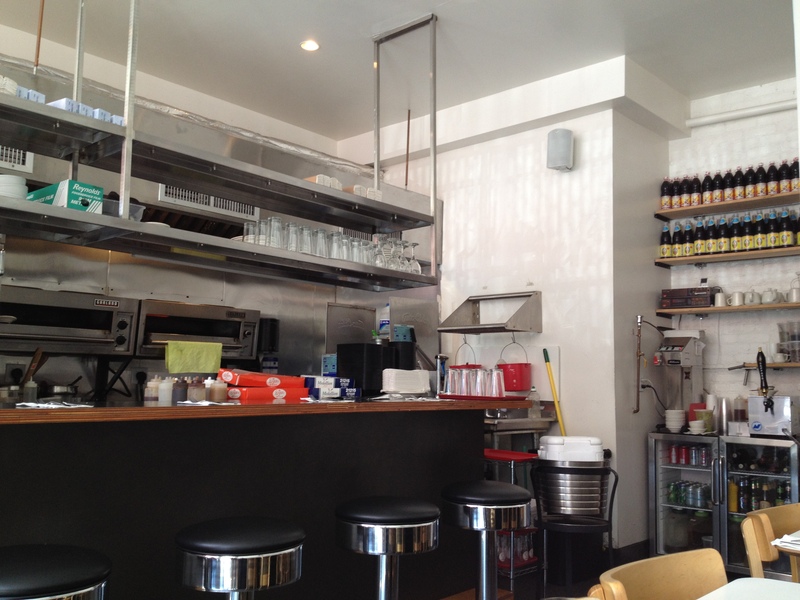 The restaurant / cafe serves what it calls “homecooked Asian comfort food”. Although I did not realize this when I went there – nothing is fried, there are no processed meats, they use natural and organic ingredients when possible. They also make their own sauces, roast their peppers themselves,… and you get the point. No wonder then that the food was fresh and delicious. The portions were generous and the service was excellent!! The restaurant is not exclusively vegan / vegetarian, but I loved the dishes that I tried there. If you are keen to know how their Shanghai-style short ribs taste, or how their steak and roasted peppers sandwich tastes, then look at Yelp. Vietnamese Summer Rolls: The rolls were very fresh and delicious, although I can’t remember tasting much shrimp in it. 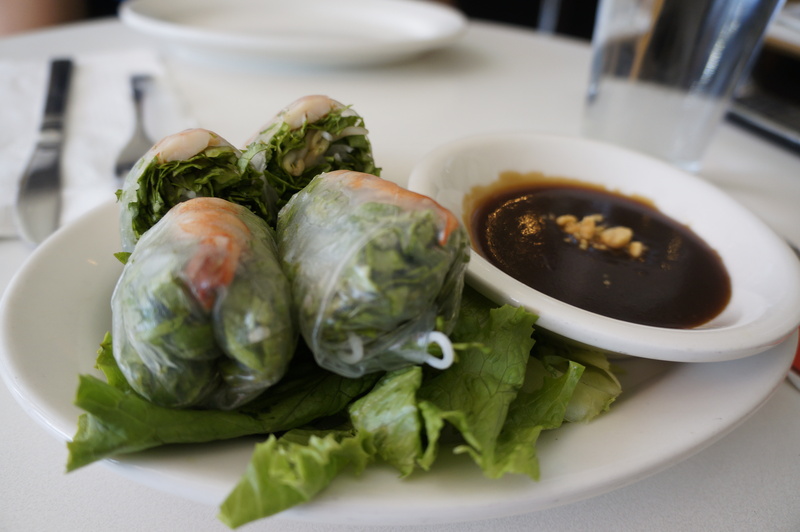 The rice paper wrap was thin, the salad leaves fresh, and dipping sauce was perfectly sweet and slightly savory with the crunchy peanuts on top. I love steamed, cooked shrimp, but will not complain if I do not get enough of it, especially when everything else in the dish tastes so fantastic. I would get this dish again when I just think of how fresh it was. Grilled Tofu and Buckwheat Soba with ginger cilantro pesto: This dish was the highlight of the lunch. I could have got it with grilled chicken, but it may not have tasted as good as it did (or may be it would have). The tofu was grilled, but ever-so-slightly that it tasted very fresh and felt very soft. The buckwheat soba noodles were cooked well and salted enough too. Often, I find that pasta / noodles are not adequately salted and therefore taste “meh”. 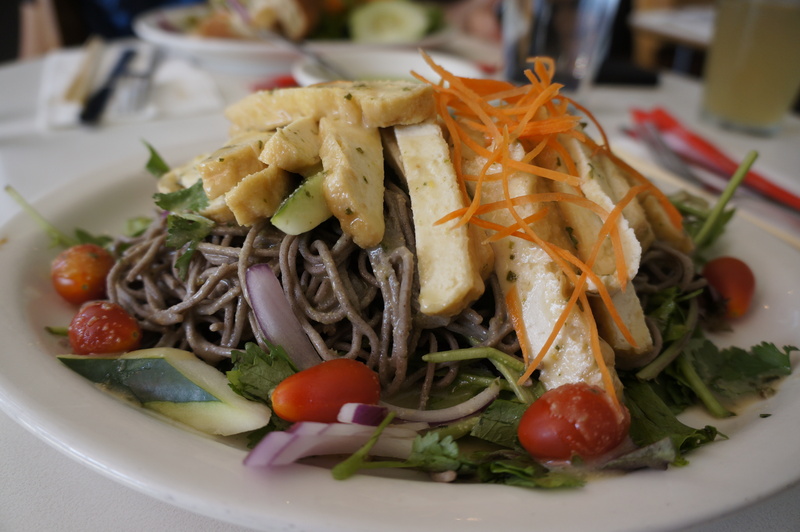 But I had no such complaints with this dish – perhaps the best buckwheat soba noodles that I have tasted in a long, long time. Other restaurants in NYC that I have had tasty soba noodles at, are Matsugen (not around any more) and Kajitsu. But these noodles are better than those served at the other two restaurants. OK, back to the dish at Mooncake Foods – the mesclun leaves were fresh, as were the grape tomatoes and the thinly grated carrots. The ginger cilantro pesto sauce accompanying the dish is highly recommended. The sauce was spicy because of the ginger (may be it had some green chilies too), but there must have been some lime to balance the ginger with its acidity. I love cilantro and ginger, so I believe that it’s the sauce that took the dish to another league. In case you were wondering, this is a fantastic vegan dish and very filling too – so I would definitely get this again (and not the chicken version). Tell me, please, have you had amazing grilled tofu elsewhere in NYC?